The Chatham Anglers (9-7-2) are coming off their third win in four games after Tuesday night’s win at Whitehouse Field in Harwich. The A’s 13 runs marked their highest total of the summer after failing to surpass five runs in their last six games. Despite its offensive outburst and blowout win on Tuesday, Chatham will look to patch up some inconsistencies before Wednesday night’s Fourth of July matchup against the Orleans Firebirds (6-12-1) at Veterans Field. For the first time in eight games, the A’s scored a run in the first inning in Tuesday’s win over Harwich. In games where they score a first-inning run, the Anglers are 3-0-1, while they are 7-1-1 when they score the first run of the game. Tuesday marked Chatham’s first double-digit scoring tally since its 10-1 win over Hyannis on June 16. Entering Tuesday, seven of the A’s last eight home runs were solo shots. On Tuesday, Tristin English (Georgia Tech) belted a grand slam and Michael Busch (North Carolina) ripped a two-run homer, both coming in the sixth inning. Thirteen different players have tallied a hit over the Anglers’ last four games. On Tuesday, nine different A’s recorded a hit while 14 of 17 players reached base. Four players — Blake Sabol (Southern California), Michael Busch (North Carolina), John Rave (Illinois State) and Jorge Arenas (Stetson) — registered a multi-hit game. 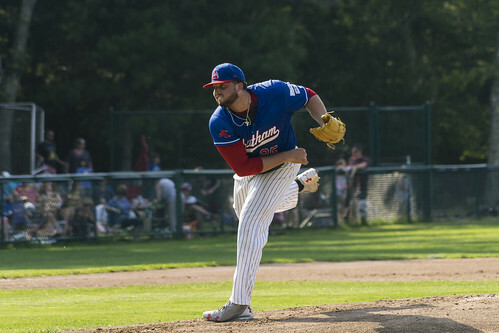 Alek Manoah allowed no hits while striking out six in Sunday's loss to Cotuit. Some of Chatham’s early-season pitching inconsistencies have returned. In Sunday’s loss at Cotuit, Alek Manoah (West Virginia) tossed four innings of no-hit ball, marking his best outing of the season. In relief, Spencer Van Scoyoc (Arizona State) conceded three runs in less than two innings before Troy Miller (Michigan) replicated Manoah’s performance by allowing no hits in 3.2 innings. Kyle Hurt (Southern California) and Jeff Belge (St. John’s) combined to allow six runs against Harwich, the lowest-scoring team in the league at 3.4 runs per game. Although the effort was overshadowed by the A’s 13 runs, A’s manager Tom Holliday said he was discontent with the pitching. Despite its occasional struggles, the Chatham staff leads the league in strikeouts (184) and ranks second in runs allowed (72). Aggression on the basepaths is something Holliday has preached all season, and it has benefitted the A’s. The Anglers lead the Cape League in stolen bases (37) and Greg Jones (UNC Wilmington) leads all players with nine. Ben Ramirez (Southern California), who swiped just two bags during the entire spring season, ranks second on the team with five stolen bases. Holliday has also emphasized the importance of the pinch-runner, and Branden Fryman (Samford) and recently-released Austin Wilhite (Georgia Tech) have played that role for Chatham. The two have combined for six stolen bases without getting caught. On July 1, Wilhite pinch-ran for English in the ninth inning and stole home on a wild pitch to tie the game at three. Chatham's multitude of multi-positional players has allowed Holliday to shuffle the lineup each game and make several late-game, offensive-oriented substitutions while keeping its defensive shape. Arenas, Fryman, Ashton McGee (North Carolina) and Rankin Woley (Auburn) can each play more than one infield position. Fryman has made starts at second base and shortstop, while Arenas has played third base twice in the A’s last three games after playing second base for the entirety of the early part of the season. CCBL Hall of Fame manager John Schiffner used to say that the Fourth of July was a major landmark during the Cape League campaign. During his final six seasons in Chatham, it appears that his players understood the significance of playing well after the holiday. From 2012-2017, the A’s were 11-1 in the two games immediately following Independence Day. The one loss was a 7-1 defeat at the hands of Cotuit in 2016. After the A’s face off against the Firebirds at Veterans Field on Wednesday, they will make their first trip to Eldridge Park to play Orleans for the second-straight day. The matchup will begin at 7 p.m.